It has been an incredibly busy few months which is why I have not been posting very much. Nevertheless, a lot is going on in our suburban garden and orchard. We had a huge crop of plums in 2012. Our biggest producer was the Morris plum, but we also received fruit from our Allred, Santa Rosa, and Bruce plum trees. The Allred was the first to ripen and produced ripe red fruit (which are pictured above) from approximately May 1st through May 15th. Our Allred is still a fairly small, young tree. It produced exceptionally small fruit this year. The fruit went relatively untouched by the birds because the red leaves of the tree hid the ripening fruit from sight. The Morris, Santa Rosa, and Bruce ripened approximately two or three weeks after the Allred and essentially ripened at the same time -- from approximately May 20th through June 10th. The fact that they are ripening at the same time is a bit disappointing to me in that I had hoped to stagger out ripening times to avoid an onslaught of an individual fruit and extend the fresh eating time for each fruit. The Morris and Allred were planted in 2009 while the Santa Rosa and Bruce were planted in 2010. The difference in one year has been dramatic, and is even more pronounced because the Morris and Allred were larger trees at planting time. Prior to this year, I think I may have had a handful of plums on both the Allred and Morris. When I say a handful, I mean 10 to 20 all of which were devoured by birds, squirrels, possums, etc. As the Spring progressed into Summer, the Morris became burdened with ripening fruit. The tree branches which wanted to shoot straight toward the sky like a water-spout became bent and lowered as they were burdened by the weight of the ripening fruit. We harvested a huge amount of fruit over four weekends. I didn't keep count, but there might have been anywhere from 200 to 400 fruit that we actually harvested. There was significantly more that was composted or discarded because the squirrels and birds had gotten to them first. We ate the majority of the fruit fresh and gave away plenty more to good friends. The rest was made into plum preserves. Some we just did not get to eat or preserve in time because it was such a large deluge of fruit in a short period of time. Next year, if I can get prepared, I wouldn't mind trying to make some plum liquour or plum wine. Additionally, I plan on taking additional steps next year to increase the size of the fruit. Because we had never gotten a crop of any size in the past, I did not bother to thin the blooms this Spring. 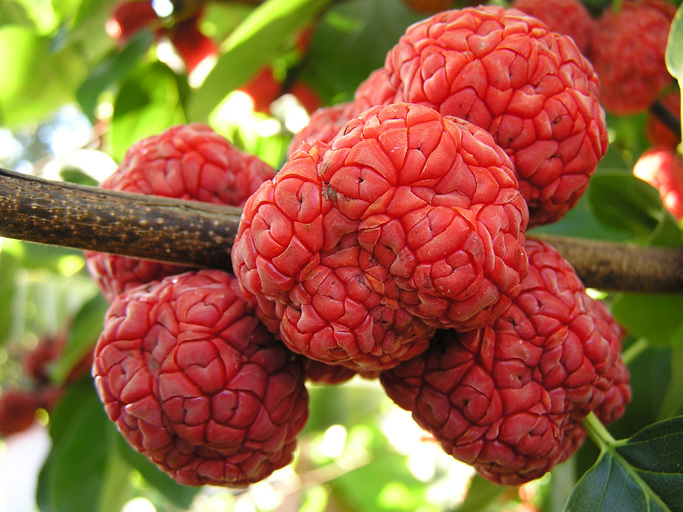 Consequently, we had too many blossoms that turned into fruit which taxed the tree and resulted in smaller fruit. Next Spring, I will think the blossoms more diligently. I think I will also prune the tree a little more aggressively this winter. I will have to read up on pruning plum trees, but I think that pruning more of the smaller branches may help reduce the number of fruit and increase fruit size. I also want to prune the canopy to keep it lower than 12 feet. The Morris is now close to 15 or 17 feet. It was a challenge harvesting all of the fruit with only a 10 foot ladder. I thought the Morris, Santa Rosa, and Bruce were comparable in taste. Possibly, the Santa Rosa and Bruce were incrementally superior in taste. These three varieties were clearly superior in taste to the Allred, in my humble opinion, but I could have been prejudiced by the significantly smaller size of the Allred. We are also growing a Toka plum, a Shiro plum, a Cambridge Gage, and a Reine Claude Doree; however, these trees are still very immature.